My participation in the Double Fine Adventure Kickstarter certainly helped me become very aware of the company and its various projects. And while I typically try wait for a game to be on sale before buying it, picking up a virtual copy of The Cave was just too tempting given all the geeky hype that had built up around the game. The Cave is rather clever given it's a puzzle platform game, similar to old classics like The Lost Vikings. And it was a game created by the great (and grumpy?) Ron Gilbert , the same man behind games like Monkey Island. And so I took the plunge and bought the game at retail via the PlayStation Network - one of my few online purchases via PSN. And hey, it's a great game. That much is clear. 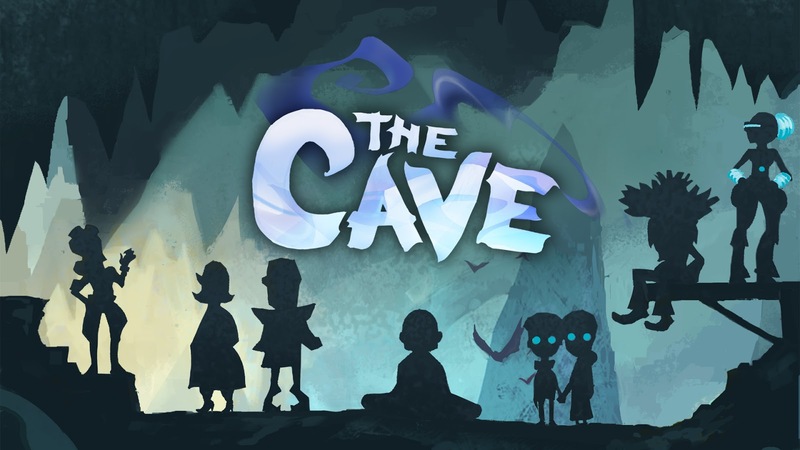 Synopsis: The Cave is a puzzle-platform / adventure game created by Ron Gilbert and developed by Double Fine Productions. I has been released on a wide number of platforms including the PlayStation 3, the Xbox 360, the Wii U, and recently the Ouya. Steam also distributed the game across Windows, OS X and Linux platforms. The game begins with the option to select 3 out of 7 characters to venture into the Cave (who is voiced by Stephen Stanton) and reveal more information about their respective lives. The characters are the Monk, the Adventurer, the Hillbilly, the Scientist, the Twins, and Knight, and the Time Traveller. Each have a unique ability that will be needed to solve the puzzles related to them. But for the most part you'll make the most of having all three characters working in-tandem in order to get the job done. The map reveals different parts of the cave in line with the characters that you select. In addition, there are various symbols drawn on the cave walls that correspond to each of the characters. When you trigger the right character, you'll unlock a story panel showing a moment from the lives of these different characters. Thus we get more of the backstory without relying on actual words or cut scenes. The puzzles in the game are nicely challenging and you'll find yourself solving the same problem in multiple ways depending on which characters are in your team. Given the fact that there are seven characters overall, that means that it will take at least three playthroughs to finish all the character stories - and this isn't counting trying to unlock all of the cave's secrets and potential trophies. The platforming aspect is largely 2D despite how the environments were rendered in a 3D style. But this also leads to some rather frustrating moments when just jumping from one area to another becomes a frustrating challenge of skill and precision as you try to align things just right. I've played a few platform games in my lifetime and this game could certainly benefit from more tweaking in this area to make it a little less frustrating. I'm okay with puzzles that are hard to solve - I hate it when my failure is because my character can't seem to jump high enough to get out. The game shares the same clever humor that we've seen in past Double Fine games and more importantly in past Ron Gilbert games. At times it feels like the adventure side of things is what's most dominant as we try to figure out the secret that each character is hiding. At other times you're just in pure puzzle-solving mode as you try to find key objects and figure out where they're going to be best utilized. The Cave is a delightful hybrid across several game genres while still delivering a pretty consistent experience. Trophies could have been a bit more apparent and the platform aspect to things could have been smoother but on the whole it's still a fun experience. Thus the game gets a good 4 unique character abilities blazing through the cave's challenges out of a possible 5.